On Wednesday, it became necessary to buy new tires for the VW Van. The 1,000 Kilometers from Timisoara to Zalau, much on back roads in ill repair, did in the front tires. For $125.00 each I replaced them but it took nearly a day to find and fit them to the car. Tires are easy to find in Romania but only in popular sizes. The new tires both went flat and had to be exchanged on Thursday, without charge but much bickering. The service Wednesday centered on the dangers of gossip at the request of Pastor Streghor as one church member left her husband and children that day for personal reasons. Following church Wednesday evening, Anna Tiripa (age 11) gave me a concert on the piano which was donated several years ago by the Pitts Family. The piano is in a storage room beneath the apartment at the church. It is a tiny room and unheated but Anna practices very seriously several times a week regardless of the cold! I lodged a complaint in Bucharest as to our Shoeboxes being held up at the border, withdrawing our payment and alleging religious discrimination. Thursday morning two trucks arrived with our 10,000 Christmas Shoeboxes at the Braila Church. Marin will spend the next two weeks delivering them to various villages and towns in Eastern Romania. The most we have ever had before was 6,000 so this is a blessing. We paid $1,000 in handing, $600 by Marin’s father and the balance by Caleb Ministry. 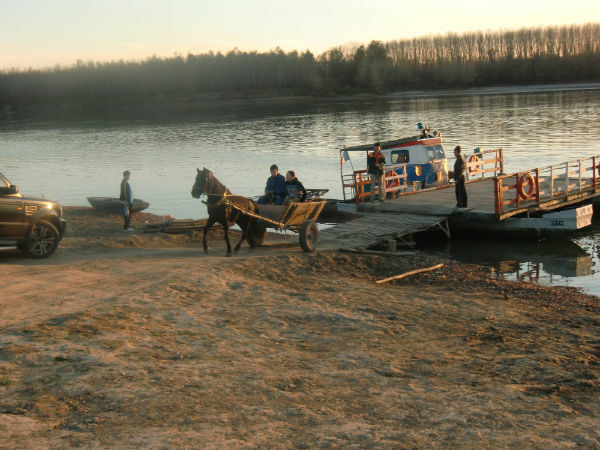 Marin is assuming the delivery cost but we gave an additional $300.00 to cover cost to the Danube Delta churches for fuel costs. Some larger churches will pick them up at Braila. It was very emotional to see all the shoe boxes arrive. Most came from Germany and France and England. It is awesome to know 10,000 children will now receive a Christmas Gift this year, many for the first time ever. Traditional in Romania and gypsy villages is a piece of candy in the shoe on December 5th as a reward for being good. The culprit is St. Nickolas. Then Christmas day food is given usually at a church fellowship. To this Caleb adds the Shoe Box gift for the children and a candy pack, and a gift of seven days food for each family. Then on New Year’s Eve they get an additional seven days food for each family. Thursday night Sister Johanna has us over to dinner to thank us for Caleb’s visit this year. She does this nearly every trip, serving a special meal as a thank you. This time it was fit5st course of sliced luncheon meat, Boef salad (like potato salad but with meat and peppers added), and second course of chicken and cabbage salad. Her son Lorenz was home and joined us. Her husband Livio is at Sea, a merchant seaman. Oldest son Lorenzo is merchant seamen but presently home. Second boy is Michael, in medical school at Bucharest and third son Cornell is in flight school at Cluj. The family earns well above the average income due to Livio going to sea 18 to 24 months at a time. They sponsor much of the church work along with Marin and Cristina. We visit Nukutsa and his Downs Syndrome daughter Estera, now living in an apartment in the old port section of Braila. Thursday night is church and during the service we are told a gypsy lady visiting at The Colony (gypsy slums) has died. She is Hungarian lady who came for a visit but suddenly died. The family has no church affiliation of money. Friday I am to be at India Embassy to process my visa application but Marin and I decide instead it is more important to tend to the gypsy lady. The family has no money for coffin, funeral or services. The belief among these people is you must have a service by a church as the church then witnesses before Christ of your faith so you can enter heaven. Without the service you are condemned! Any church is unwilling to accept non-members because they fear the unbeliever weakens the church in spiritual places and may even condemn it as a whole if burying an unbeliever. So we let Caleb sponsor the lady Iona Serbian, age 62, buying the coffin and funeral linens and some flowers; Marin sings as I preach the funeral service at the Colony. This becomes a big testimony to the non-believers in the Colony and they are moved by our willingness to accept one of their people. The family she was visiting is very grateful. Our expense is about $400.00 including burial and just one day of our time. Caleb purchased solar-powered players from FAITHCOMESBYHEARING ministry. These are solar-powered or electric alternative radios that play just the Bible, Old and New Testaments, as daily devotion, or reading plan, or just going through the Bible. We purchased them in Gypsy, Romanian, and Ilicano (The Philippines) for villages with non-reading skills. At Braila we gathered about 20 gypsies and tried them out. They were very well received and reading schedules set up to rotate the players among families. (One problem is one "gypsy player" actually was "Russian player" but we found a Russian village for it!). The Pastors were very excited and asked for more players. Cristina is setting up a booth in the Town Square to play them each Sunday Afternoon! The machines are $100.00 each but virtually indestructible so worth the money! From there Marin and I rush to Bucharest to spend the night so I can fly out at 4:30 AM for Amsterdam and then Seattle. What a wonderful journey 2012 was in Romania! It is now Friday after Thanksgiving but no one is Christmas shopping here. We visited a market for a few groceries. Marin and I had lunch at XXL Penny Market (grocery store) of chicken thigh-leg and potatoes. Right after, Marin got a call from Elder Dan reminding him we would visit his mother with him this morning. It is important as she has rejected Christ and he wants us to speak with her. We hurry over to the gypsy section near Lacu Sarat and meet her. She has prepared lunch and insists we eat! I full plate of Samale^ with sour cream and chunks of roasted pork. It is delicious, truly wonderful and we do our best. We talk with her at length about Christ. Her complaint is the legalism of churches so I explain they are mans’ institution to get us to know God but are far from perfect. She does not like sitting separate from her son and I tell her it is not a problem. Just go ahead and sit with him and I bet no one complains. She does not like to cover her head and again I say it is truly not a big deal but in time she probably will feel more comfortable conforming to traditions but is not necessary. She acknowledges God but not quite sold on idea of Christ but she agrees to come on Sunday morning. (Actually several gypsies do not cover their head and they sit randomly so she should do fine. We get back to the apartment, skip lunch and dinner, and then go to the Colony for service. It is so much fun with the gypsies as they sing and worship with deep passion. This is THIRD gypsy church at the Colony now with about 60 people in it. Other two are running about 100 each. Colony has population near 800 so the church is making great strides! I preached on Paul at Mars Hill and how God used history to prepare Paul’s entrance by having Athenians erect a monument to “The Unknown God” hundreds of years before. Following the service we pass out candy packs to the kids. I told the adults about Ted Rihanek and how he use to make the Caleb Buttons in the Candy Packs using the platform mounted on his scooter, as he could not walk. They were quite moved to learn he went on to glory and took time to pray for Florence and the family and friends of Ted Rihanek. From there we go to Marin’s fathers’ house to pray with Brother Metica and family. First time they have joined us since the house incident. I preached on End Times (Marin’s’ fathers favorite topic) and then we prayed together on the floor. It always humbles me to see these Pentecostal Christians kneeling on cold marble floors praying for 10 to 20 minutes to the Lord! Great time this evening spending time again with Marius Metica and the family and good opening to reconciliation between Tiripas and Meticas. Saturday Morning we uncovered the items shipped from Seattle for distribution this trip. We have pain medicines for Mrs Bolohan in Frumose near Suceavea, special clothing for several families, and the HearTheWord Solar-powered audio bibles in Gypsy and in Romanian. Cristina WAS THRILLED with both and said she will set a rotating schedule of one week for the responsible gypsy families for their radio and will set up the Romanian language one to preach each Sunday in the town square! They request many more of the hygiene kits for the young girls in the gypsy colony. They are very successful here. In the afternoon, Marin and I took food, clothes and candy packs over across the Danube to Greci. You may recall, Caleb built a church there years ago to serve the wilderness village of Greci where the lepers were driven in times past. Buying a farm and sinking a well which we opened to the entire village, our little church became a “Beacon in the Wilderness” with a nurse living in the farmhouse and providing free medical care to the village so they did not have to travel to Bucharest or face possible institutionalization. After seven years, the nurse died and a young pastor named Sarin moved in with his wife and seven boys. They developed the gardens and fruit trees and grapes as well as the church. The province established a state health clinic removing that concern on our part. Two years ago Pastor Sarin left. Then in the spring Greci was flooded. The church was preserved, water just damaging the outer wall foundation as to appearance, but the barn and house were severely damaged, the house one-third destroyed. The mayor provided assistance to all other homes for rebuilding but refused our request. I reminded him we held an agricultural permit and could easily raise 50-60 pigs on the land in the heart of the city, and he changed his mind and gave us our share of supplies. Marin has reinforced the home, reducing it to two rooms, and settling a homeless couple there with their three-year-old daughter. We visited them and provided food and supplies to keep them going. The well was destroyed so they need $300 to bring back water to the house from city water system now operating. I am considering donating the $300 from Caleb. Sunday it was pack and prepare to leave following service. I preached on Deuteronomy 30 at Braila Filedelphia Church and was so pleased to see Daniel and his mother, Peter Chilliana, and the entire Metika family there! The service was packed and went from 8 am to 1:30 pm. Cristina translated for me. Now, we head across country so no idea when can write again. Outside Piteste on the “new freeway” we hit an uncovered manhole and lost a tire but nothing more severe. It was funny in a way as Pastor Arel in Chiscan asked us to deliver some supplies to his two daughters in school in Timisoara. We agreed and when we picked up the boxes his wife gave us a platter of cookies and sweets as a thank you. They were on the back seat until the manhole incident. The sweet smell of chocolate permeates our VW van as we drive! We stayed the night at a hotel/motel outside Piteste with the bargain price including complimentary breakfast at 6 am to 10 am. In the morning we were not surprised to have breakfast changed from 10 AM to noon, a common event in the motel/hotel trade here. No refunds. We left at 6:30 and headed east, stopping at one of my favorite roadside restaurants in deArges area. It has big VISA sign in front but each time we eat there they explain sign just looks good but they have no credit card service. Had a mushroom omelet….very flat but warm, being two eggs cooked flat and then rolled around mushrooms and topped with grated sheep cheese. Not great but common. Marin had Tripe Chorba, a favorite for breakfast by Romanians but not me. Entire meal plus two small (Turkish) coffees was equivalent of $10.00 US. I never get use to the waiters greeting you with ashtray and four “complementary cigarettes” in many Romanian roadside establishments. The packs say “Winston” or “Marlboro” or “Mosrh” (Russian) but they are all produced here in Turkey using famous names and logos. We receive cell phone calls from Marin’s father and then from Arel at Chiscan. Both are scheduling “Long Night” services for Friday night in hopes of getting us back to Braila sooner. They do not share well with the West! Unlikely we will be back Friday. Arriving at Petrosani in the south end of the Transylvania Mountains in Western Romania, we are about 60 miles from Serbia. This was Caleb Base in Romania for many years after we departed Suceavea. Gigi is head of the family Fam Coicheci Gheorghe and for years he drove me throughout Romania before I met Marin. Caleb helped build the Filedelphia Church in Petrosani, Dental Clinic, big medical clinic, bible school, and network of churches. They have an apartment in the church for when I visit. I first met Gigi in 1993 when his oldest child Roxanna was but 4 months old. They have now had 5 children; all whom I watched grow as honorary “uncle”. Roxanne just got married and lives in Vienna. Cosmo and Claudio are in college in Timisoara. Sergio is senior in high school and Bianca is sophomore in high school. (Makes me feel old!) His wife Daniella welcomes us enthusiastically and settles us in the church apartment. Gigi gets off work in the coal mines at 7 PM and rushes to meet us as we have dinner at their apartment. When I first met Gigi, he was an elder under Pastor Ile Trian in the First Church (Emanuel) in Petrosani, and they were building Filedelphia Church. Now, Ile retired and Gigi is Senior Pastor with 6 assistants. They have 15 satellite churches, a christen school bible school, and operate the medical and dental clinics free. When I think back to ’93 when Gigi and I traveled the country preaching in streets, construction shacks, schools and churches, it makes me very proud to see the success he has become! Tuesday Daniela brought us breakfast at the apartment so we did not have to shop. We said our goodbyes and headed north along the Transylvania Ridge to Jebel, just outside Timisoara. We arrived to find Pastor Doran and his wife has just slaughtered their BIG pig and were in the process of butchering it. As we drove in, they were in the open garage grilling pork chops freshly cut from the pig! Without losing a stroke, Doran’s wife cut off three more slices, added them to the grill, and put Doran in charge as she went in to fix cabbage, bread and coffee! We had a fine lunch after which Marin helped finishing the butchering. It is now 9 PM and I sit at the kitchen table typing as Doran and his wife are filling the intestines with pig parts creaking sausages and meats. I am very relieved we arrived for Marin to help as it would have taken them all night to complete the process. I think they did not realize how much was involved. His youngest son moved to New Zealand last year to manage a sheep ranch for seven years and Doran and his wife make do alone. Doran has seven small churches he operates in small villages, holding services nearly every night and relying on elders when he must be absent. They stretch a circuit of a couple hundred miles and are lots of work plus keeping his small farm going! Their two older sons live in Belgium and Holland respectively. Doran’s wife is fabulous cook and canned a lot and tends the garden. She has 4 bread making machines she uses constantly! I think she feeds a lot of the Serb refugees and Bosnians as well. We sent two containers here for which they are still very grateful. It is our impression that, though looking well, Doran has perhaps suffered physical setback as he does not discuss his 7 churches or religious questions on our visit, a previous favorite topic. He did not invite us to any church services and his wife was very guarded on what he was permitted to eat. We left after breakfast, consisting of some of the very same sausages we had helped make the day before, many fresh foods from the garden, pure organic foods and homemade bread, and Coca Cola. We received two trucks of cabbages were donated to Caleb in Chiscan and they were waiting for our return to distribute them. I asked them to take them at once to the Colony and give out as some families are having only one meal a day per Marin due to the bread shortage and absence of work. 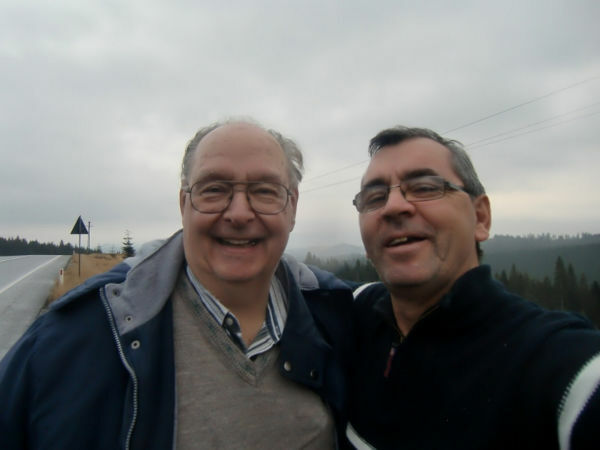 From Jebel we went north to Timisoara and Ianos Nikolai Family. We were met at the family apartment by Andrew (Andre’), the youngest son. When Ianos went to Australia in 1996 to initiate Romanian Pentecostal churches for the 5,000 Romanian immigrants in the Melbourne area, I made three summer trips to help, preaching in seven churches there, helping with immigration documents, and living with Ianos family, the boys Icka, Andrew and daughter Diana, and Ianos wife Maria. Andrew was “coming of age” at this time and acting out severely, to the point of leaving the family and living with unsavory people. I counseled Andrew and prayed with him frequently when he would permit it but our last meeting there was in 1998 when he refused to return to the family and chose to stay in Australia when they returned to Romania that fall. Our last meeting there was in the parking lot of Sunshine Church when I called upon family and friends to let Andrew go (he was 19) but to uphold him in prayer, calling for Jesus protection. He got in a vehicle and left as we were praying for him. He came back to Romania in 2002 but was very changed and worldly. Two years ago he was selling “designer luxury clothes and jewelry” when I saw him, but was cordial towards me. Now, we find a totally changed Andrew. He is in plain clothes, living back within the family, and totally devoted to Jesus! He asks me to come and meet his wife and to pray for her, their two children, and to anoint their apartment. When we go, he tells me after that two years ago he was sitting in a bar having a drink and high on drugs, living a life of worldly luxury, when he saw me in a vision, I was on my knees praying for him and leading the family in prayer for him. I was dressed in “heavenly robes” and in “The Spirit” rather than the flesh. He immediately asked forgiveness of his family, of Jesus, and has been waiting opportunity to ask my forgiveness! He said he threw out $40,000.00 in clothes and junk, and Jesus taught him to dress not to attract attention but just to serve his needs. He now works with Diane and their cousin Irene in shipping parcels USA/Romania. He starts each day by walking to the church to pray for a half hour and he never misses a service or meeting. It truly is a miracle! He stays with us the entire time we are in Timisoara, driving us and doing all he can to help us! Diana and Ianos arrive home along with the rest of the family. It is a very busy time as Diana is getting married December 8th, the day I leave for Seattle. Her fiancé Daniel is a Serbian Pentecostal attending College here in Timisoara with Diana. He asks my consent to wed Diana as I am like a surrogate father to her. We counsel and then together the three of us at Diana’s request. I give my blessing and visit the apartment they are fixing up (Andrew driving) and we anoint the corners and pray as we did at Daniels. Returning to the family apartment, Ianos conducts an intensive bible study at the dining room table (Hebrews 10:22-29) as the family prepares lunch/dinner. Ianos is drawing a distinction here between Jesus Spirit which pervades the Old Testament, and the Indwelling Holy Spirit he sends to us in the New Testament. Also living here is Maria, the wife of Marcello Tinctin and their new baby. Marcello is back in Australia with the other 8 children. His twin brother Virgil, also having 8 children, is back in Australia but calls me when he learns I am in Romania. Virgil and Marcello are very special friends from the Romanian immigrant community I spent much time with in Australia. Also, Gabriel. the interpreter I used in Melbourne and on the Country Evangelism Tour in Australia in 1998 calls as well. It is a very special visit for me in Timisoara as you can imagine and one surprise was to see Marin and Ianos hit it off very well. Marin barely met Ianos before and never talked with him. This trip they became very close as they agree on so much in scripture. After dinner, Ianos invites us to the weekly prayer meeting in the neighborhood. Held in a room of a construction firm, I struggle up the three stair cases. Ianos teaches along with three other pastors, short messages each leading into a season of prayer. In between, Marin is called upon to sing several songs, which are like sermons in themselves as each tells a spiritual message. The Romanian song ministry is very strong and each area of the country has their own, nurtured during communism. Marin manages to fine five or six songs they have not heard before here in Timisoara. Two visions are given regarding me during the prayer meeting. The first was through Ianos and it was a “burned field” in the country that keeps getting lush green vegetation over and over. The second, from a man I never met, is a vision of two staircases as if “flying by themselves”. I am on the upper staircase and flams are shooting out my arms as I am outstretched. They do not burn up but send light out in all directions. The second lower staircase has Marin whose prayer is supporting first staircase, but no flames or fire. Marin liked that one! They were nice but I tend to base my impressions on visions and tongues I receive direct. We return for dinner and I learn I am invited to preach at Elim Pentecostal Church Wednesday evening service and that Inspiration Television is sending a reporter to do a 30 minute interview on my testimony earlier in the day. Inspirion is based in Timisoara and is like TBN in USA. It is late Tuesday night. Dinner was described for me by Ianos as “boy of the cow” as he knows little English. It was like a veal stroganoff and very good! Maria made mushroom Chorba for me, knowing it is my favorite. We returned to Ianos apartment and are led across the street to a cousin where we sleep the night. Next morning as we get up Daniel Beneleau who I knew in Braila has arrived to invite us for lunch to visit his two babies and wife. We agree. Andre was outside at 7:30 AM waiting for us to Walk, having returned from church prayer. Andre’ visits with Daniel in the street and calls on Marin’s cell as we get the lady up to unlock the house so we can leave. Andre’ has two families for us to visit for prayer. The first is on third floor walk-up, giving me much exercise. It is very sick lady with a bad heart. From there we go to hospital where we anoint and pray over a Pastor friend of Andres’ in the intensive care ward. You should have seen him working to staff to get me in. As I anointed and prayed, both the Pastor and Andre ‘were certain they saw bright healing light coming down. I saw nothing but felt something clearly beyond explanation. Returning to Ianos apartment we await the television people from Inspiration TV (Romanian Christian Network). Andre takes us to 4th floor apartment for prayer for lady and her two grown daughters. We are served juice and cake as we visit and then I am asked to pray for daughter with sleeping problems. I anoint her and we all pray. I gather through The Spirit her problem is not spiritual but physical after very intensive prayer. I am asked to pray for mother and other daughter and receive strong responses. Finishing, the first daughter I receive response that her difficulties are not spiritual as the mother believed but rather behavioral and I proceed to tell her this in a gentle fashion. She then admits she lives alone and chooses to stay up all night watching television rather than getting her sleep. Her mother is embarrassed by this but I tell her not to be. The girl still needs prayer to put her life in order. She is in her 20’s and needs routine and discipline to get her life in order. We pray for the second daughter and then the mother and the household. While praying, the mother receives a vision for me. She sees a man coming before me who is about to go to India. The man needs help in refining his weapons of spiritual warfare because the idols and spirits in India wait to battle with him. She is not certain when the man will go but says he will prevail if he keeps his eyes straight ahead in the battle but I must prepare him. She I shaken by this vision and find difficulty in expressing it and show much concern for the man. Marin is taken aback because only he and I realize the man going to India is I. The people in Timisoara have no idea I have made this schedule. I ask several ways to describe the man going to India and the response repeatedly is “it is unclear, but you must prepare him as he will need many weapons”. Andre’ figures out it is me but the lady and her daughter do not. We return to Ianos house where Marin drinks his first Latte’ and eats hi first yogurt, two things he has always avoided, and then says he wants to go to India with me! We are scheduled on Friday to apply for our Visas in the India Embassy in Bucharest. Diane and her husband-to-be Daniel arrive with news we have been invited to Serbia on our next trip to address the 1700 member Pentecostal Church in south Serbia about 80 miles from Timisoara. The Pastor has invited us to use their retreat center and teach for two or three days. I have preached in Serbia before, the border is fuzzy here, but not in Pentecostal church. There are only about 3,000 Pentecostals in the entire country and they nearly operate underground still. Three southern communities are nearly 100% Pentecostals which is why the one church there is so big. Andre’ and Diane and their cousin Irene Nikolai from Detroit operate a business of shipping parcels between USA and Romania. They are a little more expensive than the Faraway Lands service we use in Seattle ($1.10/pound versus $1.40/pound) and ship from Detroit. Irene is visiting for the wedding. (I performed her wedding 11 years ago in Detroit to Ianos son Nic) They offer to ship our boxes FREE from now on from Seattle to Romania, 12 to 15 per month. This is a huge gift to us and they agree they will pick them up in Seattle. This will save Caleb Ministries about $800 a month! The Television Reporter does not arrive and it is now time to go to church at Elim Pentecostal Church in Timisoara for Wednesday Night services. The Pastor has asked I come and preach this evening, sharing the pulpit for the Wednesday night service with a young pastor from Moldova. I was asked at the last minute to present my testimony rather than preaching as they have heard of it for years from Ianos but not heard it personally. (This is like 40 minutes before I am to speak. I rarely give the testimony anymore as it is very emotional for me but I consent. The Elim Church is the largest in Romania, 5,000 members, and has its own brass band, orchestra, string orchestra and choir. They televise all their services via internet throughout the world. www.Elim.ro (Select the streaming or download of 29 Noi 2012 Joi Emi Fedur) My presentation (in English and translated into Romanian, begins 45 minutes into the service. The Elim Church in Timisoara has hundreds of satellite churches and affiliates in Canada, USA, England, and Australia and around the world. The denomination has 9,000 churches worldwide. That they permitted me to preach and then selected it to be online is a great honor. Ianos and his family sit in front beaming the entire time as I speak and though I must condense much of it to fit, it is just like I was preaching back in Australia with them in 1996-1997-1998. Returning to Ianos House, we have evening prayers and then dinner. It is decided by Elim Pastor that the television can use the internet program. The church televised it on their station and on radio already live but I was not told until later. Thursday morning we awake to find Andre’ waiting with two more families to visit and pray for before heading over to visit Daniel Beneleau and his family and then leaving Timisoara. We get to Daniels precisely at noon and Andre is still with us. As we visit, Daniel serves a careful lunch, having been overly warned about my sugar aversion and seafood allergy. This young man who left Romania to work in Spain and experience the worldly and then returned, is a true delight for me. (I carry his photo still in my Bible to remind me to pray for him) His choice of lunch for all of us is a platter of organic goat cheese, organic sheep cheese, organic buffalo cheese, goat yogurt drink, organic good cholesterol only pork. Trust me; it tastes as good as it sounds. It was so clear he was trying hard to keep me healthy. But then he brought out a platter of jellied donuts…..this I cannot reconcile. Taking leave of Timisoara after three days was very hard but we had to move on. Andre’ and Diana and Sammy could not have been more generous hosts and it was such a great gift to see Ianos and his wife Maria looking so well. Thursday was December 1st, the National Birthday for Romania, so in many villages and towns as we traveled we encountered celebrations, parades, cultural dances and family and village crests. It was also the day news arrived of Larry Hagmans death so radio was recalling the series Dallas. It was first Western TV show to be broadcast in Romania, followed 2 years later by Twin Peaks. The announcer on radio laments for the first five years following the revolution they were treated to three hours of TV a night, same program each night for a week. First hour was political speeches, 2nd hour Dallas, and third hour political speeches. He says it was “local corruption, USA corruption, and our national corruption”. Thursday was rainy with intermittent snow as we traveled 800 kilometers from Timisoara to the town of Zalau, outside Cluj in the countryside. Here, we arrived at 9 PM looking for parents-in-law of Brad & Melinda Herman. Three cab drivers said the address did not exist. Another insisted the entire bloc did not exist. Still, by deduction we found it but it was 10:30 at night and no one answered the door. So we journeyed on the Dej and found a motel for the night, having driven over 1,000 kilometers from Timisoara (625 miles) on less than ideal roads. Having breakfast of plain omelet and mushroom sauce and coffee at the motel, I barely got out the door before loosing all of it in flowerbed! The salt burned my throat. Should have had the tripe chorba like Marin! We journeys on through the mountains into Moldova. With light snowfall, the countryside is beautiful with small villages nestled in valleys, church steeples reaching up from each town, and horse-drawn carts everywhere hauling wood for the winter months. At Suceavea we ventured down back roads to Frumose where we found the widow Mrs. Bolohan. Her husband was murdered two years ago, senselessly by a young man who beat him about the head because Mr. Bolohan “looked strange”. We had provided numerous surgeries and treatments to Mr. Bolohan, a peasant with no medical coverage, as he was burned about the face by a bucket of flaming tar while roofing a barn. His ears and eye-lobes were rebuilt, features restored and he was able to work to support his family again. The young man served two years in jail and was ordered to pay a monthly pension to Mrs. Bolohan but she has refused to receive it, saying he needs to get on with his life. She asked us for pain medicines for her rheumatism which we brought to her on this journey. After visiting with Mrs. Bolohan and gifting her three years of meds and some funds for her comfort, we went on to Iasi, to Marin’s in-laws for two nights. Here we rested Saturday, learning our Christmas Shoeboxes were held up by the European Union at the border but may be released in two weeks. The European Union refuses to acknowledge needy children within their borders. Marin says it may be Christmas in February, but it will happen! Saturday evening, I received two visions in my sleep, which repeated several times. The first was a silhouette of a New Jerusalem, as floating in the air or above the horizon. There is a high prayer tower and a hand comes down and taps the tower, indicating “it is complete” or “it is finished”. The city then lights in a glow like soft fire-hearth light and whisks off. The hand then returns and a much older city appears and the hand or a finger actually, hovers over and individuals fly up to it. A voice says selection is done and the faithful of old now complete the city. My impression was that my witness to Saints was fulfilled and Old Testament faithful now will complete the city. I do not know if this is personal just as to my work or as to all work, but my sense is it was just to mine. The second vision which follows shows a country road from the early 40s’ and an old car traveling towards me. I do not know if I am standing in the road or in the car. As it approaches, it comes to center of the road and straight at me. The vision ends there. It could mean anything really. Then I am given a number… 15 50 I think this might be a Bible Passage but I can find no chapter 15 with 50 versus so am puzzled. I clearly survive the car incident as the 15 50 follows. Monday morning we come back to Braila, bringing with us Daniel, Marin’s brother-in-law. He has an exam in school in Braila to take at 4 pm along with Cristina. The European Union has closed sale of honey to all who do not complete a Bee-Keeping agricultural certificate so Cristina and Daniel have been in school last 6 months to complete the course. Travel is very slow due to the snow and ice. We pass 4 accidents with cars off the road. We arrived in Braila at the school at 4 pm! Though Romanians have been keeping bees for literally centuries, the Government decided to standardize everything and chose this way. If you go back six years, The European Union struck a trade agreement with China to permit their honey and other goods into the Union. In exchange some European goods are sold in China. The result was Europe was deluged with cheap Chinese honey. As a solution, the European Union is training Romanian Beekeepers and using the funds to pay bounty to French, German, Swiss and Italian beekeepers. There is lots of black market honey in Romania now but Daniel and Cristina decided to take the courses so the family can enter the legal marketplace. It’s now Tuesday Afternoon and I rest. It was quite a test to follow up last nights “Long Night” service in Braila with the monthly program in Gropen (pronounced grow-penn) on Friday but well worth the effort! About twenty miles from Braila, Gropen is a farming village of about 5,000 people, mostly farm workers growing cabbages, potatoes or watermelon. Monthly, the Betany Pentecostal Church hosts a Friday night service which has become a “must attend” for local Pentecostals. The church is nostalgic for Marin as it is located on the lot where his birth home once stood. His family deeded the land later to the village to construct the Pentecostal Church! Service began at 6 pm sharp and concluded at 11:15 pm. Amusingly, I was seated directly next to the wood stove to be sure I stayed warm. It was very hot and a young lady kept adding more wood to the fire throughout the service. I roasted slowly…The church was full so I could not change seats. Marin was next to me and he un-layered to his tee shirt by nights end. As I was going to preach last I felt it necessary to keep my sweater on. Five hour services are common here and on Sundays the standard for Pentecostals is five hours in the morning, a lunch or supper break, and then three hours in the evening. Church began with the call to prayer. The local pastor sits up front on the platform and in this case Arel the District Director sat next to him. Two or three hymns are sung to accompaniment of a keyboard. The pastor then nods to some local or visiting pastor in the middle of the concluding song and he comes forward and kneels in prayer at the podium. When the song concludes he stands and gives a 5 to 10 minute ENTHUSIASTIC preaching on a prayer subject (i.e. Israel-Gaza conflict, people who are ill or suffering, unemployment, the economy, devotion to God, the unsaved etcetera) and then the people stand or kneel in loud prayer, most in tongues, for about 10 minutes. Another song and the pastor nods to another to come and kneel and then preach followed by song. Occasionally a prophecy is given or a psalm read…. This process repeats for two hours, last night it was 2 ½ hours as there were nine pastors who led the directed praying. Sometimes only one or two pastors or elders are utilized in this but in every Pentecostal service at least the first hour is devoted to these prayers just as our services always begin with worship time. The local pastor then called for specific prayer needs within the church community, followed by another time of loud praying. Then we had two or three songs (a cappella or with keyboard), a recitation, and then preaching began! First preacher spoke on King David. Second was evangelist from Spain who called us to praising Jesus. Another couple songs and then local pastor preached followed by Marin singing and then I preached. My topic was based loosely on the Experiencing God curriculum of Submitting to Jesus, using as text Pauls’ Damascus Road encounter (Acts 9) and how it changed him from a persecutor to one whose life was directed by the Holy Spirit. The District Director Arel gave the concluding teaching, spending much of it remarking at the energy of a 70+ evangelist! I had preached two nights before in his church at Chiscan and with him frequently in the Danube Delta churches and he finds me a fascination I guess. He then closed the service in prayer and plates of cake were passed about (a popular style bunt cake marbled with cocoa served here often) along with soda pop. Peter, the farm worker who was injured in farm machinery two years ago was at the service and we visited. His arm has healed and he can work again. Some of you may recall Marin gave him a fictitious job as accountant so we could pay him for his family needs while he was mending. He is very grateful and yet it cost Caleb very little to support them for six months. ($1200 total) Many from the Braila Church came to Gropen to hear us preach again which is why I have to change the message each time but I do not mind. They are a wonderful support group. Two carloads of the gypsies came along with our own car of 7 people. It was an awesome service. Church adjourned at 2:00 and from there we went to the village of Nickoalie Balescu (named for Romanian poet). This is a very small house church in a farming area. Many from Tulcea followed us there so the church was packed. Half way through the service 21 men arrived carrying an elderly man in a chair. He reportedly was dying and had stopped eating. He came that we would pray over him. After I spoke (on Acts 14 & 16, Paul’s calling of Timothy, healing the lame man at Lystra, etc.) an elderly pastor named Gergen preached. He apparently was attributed with the gift of healing hands but he was retiring and they wanted me to pray with him and the older man. When Gergen was finished preaching we went to the back where the man was in a heavy wooden chair. I anointed him and prayed and then Gergen did the same. It was quite intense as the Spirit was heavy in the room. Several began speaking in tongues and having visions. The church was clearly changed and the man affected by the prayers. The woman were crying and reaching out to touch us as we prayed. The pastor of the small church fell prostrate in the front and stayed there on the floor just crying and singing. District Director Arel concluded the service. On the way home we spoke of the perceived need for a “healing ministry” to replace Gergen and I advised any can willing believer can do the praying and anointing. They are thinking of establishing a monthly healing service rotating among the 19 Danube churches and 14 Braila churches. They have always depended on a designated “healing pastor” like Gergen but now see the weakness as he is definitely leaving. I think he is burned out as he appears very weak and tired and needs a rest. Back across the Danube to Braila and we returned to the apartment to find Paul and Stephen have pink eye! So Monday was visits to the hospital to see Doctors for 3 kids. Marin worked on his house. Julian destroyed the electricity at the apartment. We had no firewood so it got very cold and damp. Folks visited all day for prayers. The Englishman we met in Tulcea was supposed to arrive in Braila to join us but he never showed at the ferry at the appointed time nor did he call. Cristina fixed fish Chorba so I fasted on Monday. Tuesday, Brother Metica (the family living in Marin’s home) called to advise his mother died in the night. We will conduct services on Thursday. She was feisty lady of 75 years age and I had prayed with her many times. I liked her a lot. Tuesday night I preached on Luke 7 (John the Baptist in prison contacting Jesus). After church there was much discussion concerning the funeral services being at Filedelphia Church) Pentecostal) or the Baptist Church. She attended Filedelphia but was member of Baptists. Baptists won so I will preach there Thursday night for the family living in Marin’s home. Wednesday was shopping for funeral preparations and making arrangements with the family for the service. Cristina and Marin show enormous Christian love and restraint under the circumstances in my eyes. Wednesday evening Marin and I, Gypsy Pastor Fannie and his wife, Gypsy Pastor Milam, and Elder Dan I went the 60 miles to the house of Soara Metica for viewing, condolences and preaching. It is a very small village but typical Romanian small farm. She lived there with her husband who I understand from others is alcoholic. He never appeared Wednesday or Thursday. I was designated to preach for the Pentecostals and another for the Baptists. Marin was to translate but said the 22 year old grandson Marius would. Marin went to the toilet just as I was called to speak. Marius tried to translate but broke into tears and it became obvious this was too hard on him. I ended and took him to the back bedroom where we talked at length. He shared much about grandmother. She taught the village school for 19 years and she told Marius about Jesus and took him through the bible in readings. He clearly is very shaken by her death. He asked if she was in hell presently. I said “what do you mean?” He replied h was told that all who die go to hell for three days to pay for their sins before being raised”. I said “No, Jesus paid that price in full!” We talked quite a while and he was very relieved. (About 3 hours!) His understandings are part Orthodox, part hearsay, and part truth. Finally we returned to Braila at 11 pm for a late snack of mushrooms picked in the park by Paul, Anna, Cristina and Claudio. They were in white sauce or there is a pot of mushroom chorba which I love! 1. Plate of 5 black olives, two slices tomato, one slice red pepper, 3 sticks of cheese, and 2 slices of salami. 3. Plate of 1 piece fried chicken, 2 pickles, and white rice. 4. A tray was passed of cookies and breads and a large pail of apples. The mayor of the village gave $1,000.00 towards funeral and feeding the village as is customary. The meal menu itself also is customary as well. Surprising was the mayor or someone found bread for the meal! We returned home 6 pm in time to start our church service. This was Thanksgiving Day, 2012 in Braila, Romania. Monday evening we visited two families in the port area. The first lives up a long curved old broken staircase so entry was slow but finally successful. They have 5 children. They live cheaply in condemned building they are trying to repair and then convince the city to let them stay. The husband had surgery on his leg and necks paid by Caleb Ministry as they are gypsy and have no state health care. The neck tumor was successful and the leg is still mending. They have a 6 month old baby, Sarei, they asked that I come to dedicate and pray for. It was a good visit and they were quite grateful. The second family is also gypsy, three children, one with severe nerve damage from birth resulting in palsy and tremors, and the young girl who suffers from what they say is a "numb leg". We had lots of fun visiting and praying with the entire family. The father asked us at church last night to make this visit for his son. He shared a vision the Lord gave regarding me that was quite beautiful, involving a heavenly garden planted in heaven of prayers given through the years for children. In Romanian soap is called Săpun so the acronym does not work in Romanian but the basic teaching principle does. I was very pleased to see Peter Chilliana at the church. When I met him three nights earlier at his mother's (The widow we took food to) he confided he had not been in a church in six years. We talked about his fathers' exile from Russia because of his faith and why he Peter had himself lost his longing for Jesus. I was so glad Peter spoke English well making it easy to minister to him. To see him back in church Tuesday night was a thrill. He arrived before we did at the church and when I walked in he gave me a big hug and a holy kiss on the neck (Romanian custom for men 1 Corinthians 16:20, Romans 16:16). This event alone of seeing him restored to fellowship in church makes my trip worthwhile to me. He stopped in Wednesday to again visit. After the service Tuesday eleven of us visited a gypsy family in Lacu Sarut to pray for a lady who is being terrorized by visions and manifestations of a crude and indecent nature. This has been going on for about four months. She has been seeing counselors and specialists but to no avail. The pastors asked we come and counsel her, pray with her and see if we can help. She is gypsy lady with five children and lives with her husband and her own extended family. The entire household is being victimized by this unpleasantness. We gathered in prayer on our knees, sang several songs, anointed the couple, and prayed at length repeating the process for the evening. The Lord revealed she has been cursed by a sorcerer (still common in gypsy cultures). We were able to identify generally the source and the reason but not the culprit. The reason was revenge for an offense to the sorcerer. My advice was that she and her husband memorize a verse a day of 1 Corinthians 13 (The Love Chapter) inasmuch as the spell is demeaning true love, and that each time an event occurs they recite the passages and command the evil spell to leave in the Name of Jesus. We plan to uphold them in prayer as a church family and to return in a few days for more concentrated prayer. Wednesday she confessed to her husband and the pastor she had been having her fortune caste along with her mother concerning the future and that she stopped paying the diviner. They are now using the memorized scripture to repudiate the attacks together. Her mother left the home. Wednesday evening was service in the Chiscan Pentecostal Church of Brother/Pastor Arel followed by a homemade pizza feast in the fellowship hall. (You do not want to experience authentic Romanian pizza as it involved lots of sour cream , French fries in the pizza , and vegetables but little meat , tomato sauce or cheese. Once I received it with a fried egg atop! Thursday evening was long night service at Braila. This custom from the dictatorship days and communism is to gather usually in a farm house at 8 or 9 in the evening as though "coming home from work" and then staying up all night praying, singing, teaching and sermons until 6 or 7 am at which all leave as though "going to work" for the day. This is how Pentecostals operated underground for years. Now, most Romanian Pentecostals have "Long Night" once a month but meeting openly in the church or a home. About 2 or 3 trays of bread and tea are passed around as a snack. In farming areas like Braila people bring baskets of food, canned goods, fruit or whatever they have and leave on the porch. The Elders then divide the supplies so each have some to take back home. Widows are given extra portions of food as are big families. Friday we went shopping for bread! It is in short supply here due to poor crops and the closure of many local bakeries unable to meet the new European Union food standards to be licensed. We went to eight stores before we could find bread, the staple food in each meal here! There is lots of animal life here..100 plus turkeys, about 9 cats, 5 puppies..and Gypsy Julian has been assigned task of keeping them out of my room as the family clothes are stored there (Stephen & Elisa have allergies/ but I cannot take it seriously as they play with the cats and dogs all the time). One cat managed to allude Julian for two days, living atop my suitcase and then inside the couch when he approached. I named her Svengali... The word "svengali" has come to refer to a person who, with evil intent, controls another person by persuasion or deceit. The Svengali may feign kindness and use manipulation to get the other person to yield his or her will. Julian has met his match. Greetings from Romania where gasoline is $7.40/gallon! I arrived on Friday and was met at the airport by Cristina, Marin and Elisia. Elisia completed her first week of tests but had to be returned to Bucharest Hospital on Monday for another week of examinations. She is 10 years old, the middle child of the Tiripa family, and afflicted to Downs Syndrome. The school where she attends in special programs decided it may be best for her to be institutionalized so the health department has ordered a battery of tests to determine if she can function in the family or should be taken by the state. The family is very upset by this intervention, of course. The first doctors in Braila administered electric shock treatments, sending her home nearly catatonic for two days! So now Cristina stays with her during all testing to be sure they do not repeat this unwarranted invasion of their daughter. She functions very well in the family and is cared for and loved by all who know her. She gave me a big hug at the airport and asked me to take her home to the family! We did. My journey from Seattle was uneventful. On the flight from Seattle to Amsterdam I visited with a couple from Hope4Children on their way to Uganda to supervise well drilling. From Amsterdam to Bucharest my companion was a man from Kenya and two Romanian college students. They read from my book “The Chorba Trail” on my kindle and were going to get their own copies. I was very tired at my arrival having acquired a serious cold on the flight. My head was spinning as we drove the three hours from Bucharest to Braila, stopping once for Chicken Chorba soup! (Delicious). The cold grew worse each day for the first week, but I am so happy to be here again among so many precious friends and 2nd family. We are living a Spartan existence with the Tiripa family. They lost their house to foreclosure (It was pledged for another house they built on the same lot but those buyers defaulted but still live there and the bank gave the Tiripas' the choice to forfeit their house or the other and they elected to give up their own house rather than put their friends on the street. The other family (Metika) use to have a vegetable and fruit stand in the marketplace. Because the standing became very difficult for both husband and wife, they sold and bought a kitchen utensil store (like a dollar store) but it failed and they lost their investment. They are back at the marketplace but earning little so far. So the whole Tiripa family has moved into the small temporary apartment above the Braila church. It is three small rooms including kitchen. Bath is down stairs behind the church. We are many....Marin & Christina, their kids Claudio (17, a nephew) Julian (The gypsy man who borrowed my underwear a few years back), Anna 12, Paul 11, Elisa 10, Steven 5, Michael 2, and now I. We have about 100 turkeys in the church yard Marin raises for income. The apartment is cold and damp but living here is necessary for now to save funds to rebuild so the family is struggling along cheerfully. It seems as if every corner is covered with damp laundry drying or plastic crates of clothes or toys or things. I am trying to get rid of the cold so rest as much as I can. The gypsies brought us an old wood stove to help keep me warm and we set it up Sunday after church. They have a gas furnace for the two rooms but Marin cleared out a storage room for me to live in which is BIG but had no heat source. The wood stove is very welcome and Claudio, Marin, Julian and Paul take shifts bringing up wood and feeding the stove. They set up dial-up internet in my room and brought up a couch for me to sleep on. I feel I am intruding having a “private room” and people tending the stove for me but they insist! Sunday morning I preached on Nehemiah and the walls being rebuilt. After, we installed the wood stove with many gypsies participating as if a ceremonial gifting to me! Sunday night Cristina insisted I rest rather than preach. (The church is very cold and drafty but they are remodeling a large room below the apartment to serve as “winter church” which can be heated.) After the service in the evening, several came from the service to greet me. I think there were 13 or 14 people in all as I entertained in my pajamas and wheezing state. But they are family and obviously did not mind the informality. Monday Marin and I drove Elisa and Cristina back to the Bucharest Hospital to have them stay the week for testing. The doctor defended his decision of using electric shock to “rule out epilepsy”. Since there had been no indications of epilepsy ever in her life, this was ridiculous and the hospital barred him from any further involvement in Elisa’s’ treatment. Back at Braila we were joined by Christina’s’ father who came from Iasi by Maxi Taxi to help look after the kids. He sleeps in the kitchen. Tuesday Evening was prayer service. 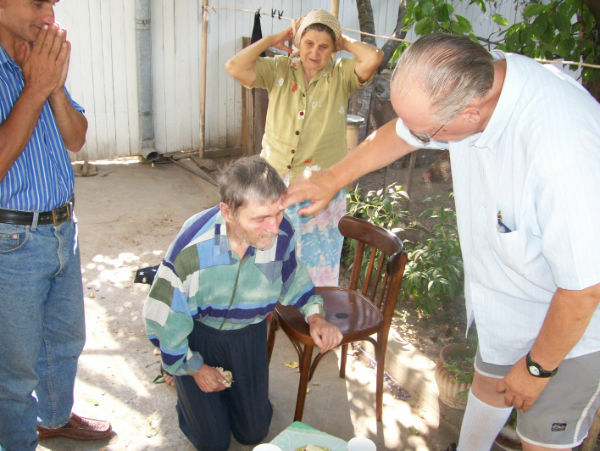 The Braila Church holds services 7 times a week…twice on Sunday and holding Monday in reserve to visit the sick. The other 14 Caleb Churches in East Romania do the same and the 19 new ones in the Delta are holding service twice a week and one night for prayers. After the service a young man came up and told me three years ago I prayed for his wife who was pregnant and told them it was a boy. They were surprised as the doctor said it would be a girl but indeed it was a boy! He asked me to dedicate him as he and his wife waited for my return. Tuesday night the Bucharest State Media reported on the voting in America and said “all who vote against Obama are racists”! This made me furious, of course. Wednesday I saw Doctor Michael who reports “you have a cold. Drink fluids and sleep”….. We gave him a turkey for his trouble. Thursday Sister Johanna served lunch for Marin and myself, Beef Chorba and then Samale’ (cabbage rolls) and pumpkin pastry for dessert. She always feeds me on my visits. Elisa returns to Bucharest Hospital for tests Monday for 10 days regarding her Downs Syndrome situation. I will write as the trip progresses but sparingly as this is slow dial-up server. Keep us in your prayers please. Thursday after church Marin and I buy groceries and get donations from the Tiripa pantry and Johanna to gift to a widow. She is the wife of brother Chilliana, the Russian I had visited many times before. They lived in Romania as he was a criminal in Russia for his Pentecostal teachings against the Russian Orthodox Church. You may recall my first visit with him he said I was “the prophet he had been expecting for 10 years to pray over me so I am consecrated and can finally go to Jesus”. He then got on his knees on the concrete patio as I anointed him and he was so relieved. He then began attending the Braila Church and we had many good visits for four years! He died last winter. His widow receives 400 lei from the Braila Church and they gift food and clothes to keep her going. Her son Peter returned from Greece where he worked. I met him for the first time and he could not stop talking about how much his father loved me and my visits. I was overwhelmed! Friday Marin and I drove back to Bucharest Hospital to get Cristina and Elisa. It was quite a sight at the hospital when the “Tiger Security Guard” demanded a bribe from Marin in order to enter the hospital drive. No bribe was paid! Cristina said the doctors released Elisa back for one month. She is to undergo special schooling in Braila and then return to Bucharest for further testing.